The fine folks at Kim Davidson Aviation have repaired my tire after the sad events last Sunday, and I took some time this afternoon to try it out. It looked like a tire that holds air when I walked around, so, off we go. 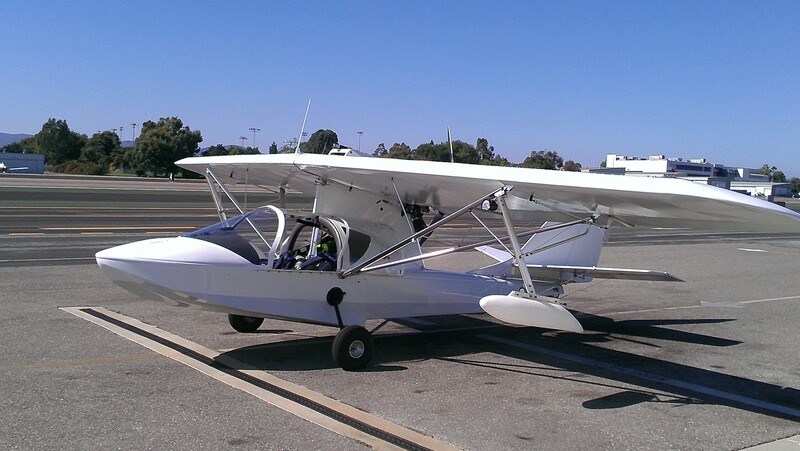 I put 5 landings on it in the heat of the day and had no problems, so I feel good about taking passengers again. I know that Kim’s guys do a great job, but I like to test these things before I put someone else in the plane. Incidentally, spending an hour in the pattern at SMO is one of my favorite things to do. It’s my home field so I know the place well, but there’s always something interesting to put a twist on things. Today it was fairly busy and had SMO’s patented late afternoon gusty winds. The airport sits on some of the higher land in the area, cut off like a little mesa and gets a strong ocean breeze. The result is a set of air currents that are surprisingly stong to a newbie and offer something new to the old hands as well. The field was also busy enough that one self-confessed country boy was very appreciative of the (excellent) controllers’ help getting in, around, and out of the field. While I was gassing up afterward I saw this puppy parked by the pumps. 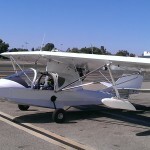 It’s a SeaRay – a homebuilt/kitplane flying boat. Click through to see the bigger pics, the thumbnails don’t do it justice. 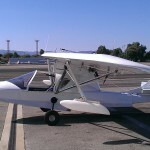 I have been very lucky so far with the things that have gone wrong in my flying career. Most of the things that have gone wrong for me have (knock wood) been small. I had another small one go wrong this weekend. 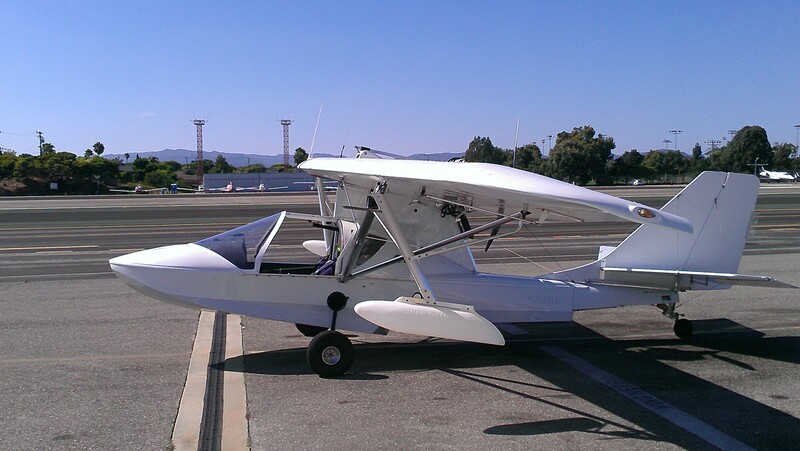 I blew a tire rolling out on a landing at Santa Monica. I was out with Marc Zorn flying approaches for instrument currency. We were actually delayed departing Santa Monica because the nose wheel tire was low. American Flyers helped us out and filled that tire. I always check the tires during my walk around, but because the nose had been low and because I’d recently had the left main tire filled, I double checked the mains when the lineman came over. No sense asking him to come back. I was surer than usual that everything was properly inflated. Marc and I shot approaches into Riverside and Chino that went pretty well. 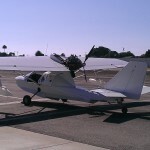 We scoped out the various interesting planes on the ground at Chino and had lunch at Flo’s Diner. From there we filed back to Santa Monica and took off. In retrospect, the roll out was my first clue something was up. Just as we were lifting off, I felt a sharp jerk to the left that didn’t feel like a wind gust. I even joked to Marc that I hoped we still had three wheels down there, but I wasn’t positive it was anything more than a crosswind gust on takeoff. 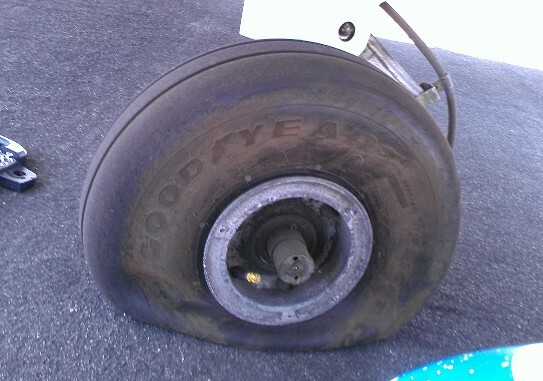 If I hadn’t had the confirmation of tire failure on landing, I might have forgotten the incident. Now I know what a tire blowing feels like. I think. Anyway, we landed pretty uneventfully at SMO, until we had cleared the runway (and, I later found out, cleared the runway safety area). As the plane slowed, it began pulling to the left and felt like a blown tire on a car. I got as far clear of the runway as possible and told the tower I thought I’d blown a tire. Sure enough, I had. The airport police towed us off the apron after removing the fairing that protects the wheel, and made an incident report. The responding officer also gave us a lift back to our car. The officer – whose name I unfortunately forgot – was really excellent. He helped us get the plane safely out of harms way before collecting the information he needed for his report. He was polite and helpful in every way. I contacted my mechanics the next day and they towed the plane back to my parking spot and put a new tire on. I’ve been thinking about whether I should have declared emergency or handled it differently. I think I did OK knowing what I knew then. The takeoff at Chino was abnormal, but it was abnormal in a new way and only slightly so. With only that evidence, I don’t think that I had enough indication of trouble to declare emergency. I thought my joke to Marc was a joke. And honestly, I don’t know that the tire blew on takeoff. It may have been fine at Chino. Beyond getting as far clear of the Santa Monica runway as possible once I had the problem, there wasn’t much else to do. But, I will take a similar abnormal takeoff more seriously in the future. Hopefully I won’t have to deal with tire trouble again for another 1600 hours. Posted in reviews | Comments Off on Review: They Eat Puppies, Don’t They? I think I’m happy that I went to public high school. Adolescence is lonely and stressful enough without the added isolation and expectations that boarding schools seem to impose, if fiction is to be believed on the matter. Jennifer Miller’s The Year of The Gadfly uses those heightened emotions to tell a compelling story. Stories set in high school are about how this time shapes people as it’s happening or how people have changed after those crucial years. Miller tells a little bit of both by splitting her narrative across three characters and two time frames. Her characters all are intricately bound to her fictional academy and the secret societies and plain cliques that animate it. As usual in a boarding school drama, these are all boiled down to their pure and symbol-laden essence. On the surface a hidden group of students is enforcing the school’s honor code to the letter through unorthodox and painful means. Underneath adolescent passions and pressures are clashing operatically and symbolically. Martin handles her timelines and character perspectives deftly. Each character sits at a different point in their development and in the development of the events that ensnare them, as well as representing a distinct point of view. The result is a look at the nominal plot and the symbolic coming-of-age drama from multiple perspective. Miller creates a nice hologram of adolescence through prose. It’s also a gripping read. The plot moves along snappily, and even as the mystery begins to resolve itself, there are twists that engage the reader. If you’re not one for prose holograms of the adolescent experience, there’s a fun ghost story/mystery here with diverting characters in the mix. And also cameos by the ghost of Edward R. Murrow. You are currently browsing the Walking on the Moon weblog archives for August, 2012.